Simple things like speaking, eating, and even smiling can all become awkward, uncomfortable, and even painful if you are missing one or more teeth. Life just isn’t as enjoyable when you have an incomplete smile, but things don’t have to stay this way. At Powell Dental Group, we’ve helped countless patients rebuild their smiles using a variety of custom-made restorations. Whether you’re missing a single tooth or require a full denture, we’re ready to provide the high-quality care you need, and it will feel like your teeth never went missing in the first place. To learn more about your replacement options, contact us today. Why Choose Powell Dental Group to Replace Missing Teeth? In short, untreated tooth loss only tends to lead to even more tooth and bone loss. Exposed gum tissue is more likely to develop an infection, and this can erode the bone supporting the neighboring teeth to the point that they need to be removed themselves. The teeth surrounding a gap also have a tendency to drift into it, which can cause alignment problems for the bite that leads to chronic jaw pain and headaches. No matter the number, it’s always best to replace any missing teeth. Dental bridges can close the space left by one or more teeth in a row, and similar to actual bridges, their support comes from either end. 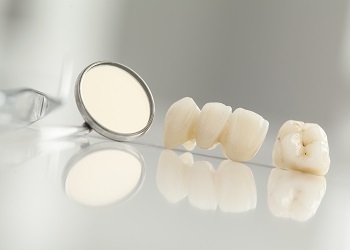 Crowns are placed on the teeth adjacent to the missing ones, and these hold the prosthetic firmly within the smile. Bridges are not only designed to look natural, but they can also prevent the remaining teeth from shifting as we touched on above. Plus, they also help restore normal chewing function. Dentures are a type of dental prosthetic that’s able to replace several missing teeth at the same time, and they have been around for hundreds of years. 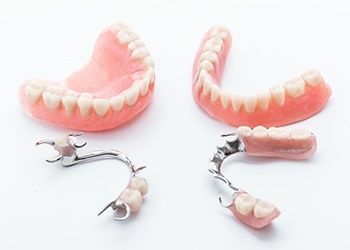 Modern-day dentures consist of high-quality ceramic teeth affixed to a hard acrylic base colored to look like gum tissue, creating a final result that is both strong and natural-looking. At Powell Dental Group, our dentures are specially-designed for each patient, and you can opt for a traditional removable denture or even get one secured using dental implants (more on this below). At Powell Dental Group, we’re proud to offer a uniquely advanced denture option that utilizes state-of-the-art dental implants but costs far less than traditional hybrid prosthetic. The Conus Denture provides a very secure and reliable fit; it also maintains its everyday removability, allowing for easy cleaning. 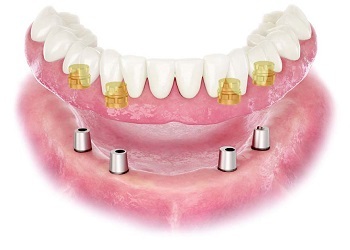 In most cases, your existing denture can even be modified to accommodate the new implants. They will lock into place through friction, which means you can chew and speak with total confidence once more. 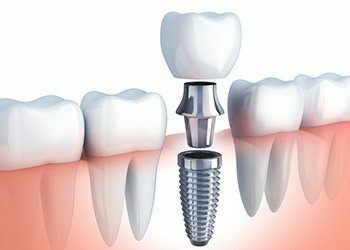 While other replacements only bring back a tooth above the gum line, dental implants distinguish themselves by restoring the root as well using a small titanium post placed within the jawbone. This delivers an unmatched amount of stability for the new teeth, creating a final result that is the next best thing to nature. Here, patients can get single, multiple, and even implant dentures to completely rebuild their smiles for a lifetime to come.